Tolomatic's B3S series rodless screw actuator is designed for carrying moderate to heavy loads and accommodating the associated bending and dynamic moments. Based upon our BC3 pneumatic band cylinder, it utilizes a patented integral recirculating ball bearing guideance system that provides consistent and durable performance. 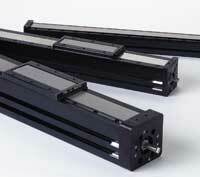 Customized stroke lengths up to 120 inches and multiple screw options are available.